For more than 50 years, state housing finance agencies (HFAs) have played a central role in the nation’s affordable housing system. HFAs have delivered more than $450 billion in financing to make possible the purchase, development, and rehabilitation of more than 7 million affordable homes and rental apartments for low- and middle-income households. Every state HFA was created by its state to meet its particular affordable housing needs. Most HFAs are independent entities that operate under the direction of a board of directors appointed by their state’s governor. Most HFAs are fully self-supporting, operating in the capital markets without the financial backing of their respective states and generating their own resources to fund their activities. Each state HFA in its own ways combines the financial tools and business discipline of a large-scale lending institution with the planning and policy-making responsibilities of a mission-oriented, public-purpose agency. In the decade since the Great Recession, HFA business models and program activities have evolved significantly, positioning the agencies to remain key players in addressing their states’ and the nation’s housing challenges in the years ahead. Generators of economic benefits for their states. HFAs utilize their authority to issue bonds to generate financing to support affordable homeownership opportunity and rental housing development and preservation. In many cases, these bonds are exempt from federal income taxes, so the investors in them are willing to accept a lower rate of return, which HFAs pass along to their borrowers in the form of lower loan interest rates. HFA bond programs generate revenue for the agencies, which enable them to be largely self-supporting and to provide additional funding from their earnings to invest in affordable housing for their states. As of 2016, total state HFA assets were more than $131 billion, having stabilized and begun to improve since the Great Recession, according to Fitch Ratings. 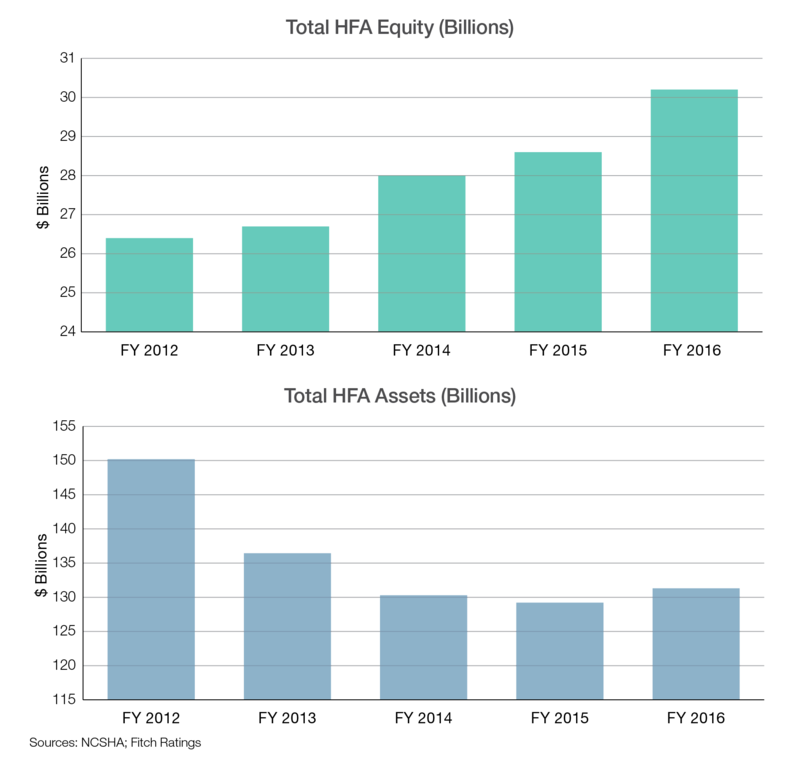 Total state HFA equity as of 2016 was more than $30 billion, up 14 percent since 2012, according to Fitch Ratings. State HFAs maintain consistently high credit ratings, currently ranging from A to AAA, as of the end of 2017, according to S&P Global Ratings. No state HFA bond issue has ever defaulted in paying bond holders. HFAs provide financing for affordable homeownership through several primary means, including tax-exempt mortgage revenue bonds (MRbs), and alternative financing executions through the secondary mortgage market, such as mortgage-backed securities. HFAs’ abilities to access the capital markets through a variety of strategies enables them to deliver housing financing that is responsive to the housing market needs in their states. HFAs are reliable sources of capital in any phase of the economic cycle. In 2016, HFAs issued more than $6 billion in MRbs and leveraged nearly $16 billion in alternative funding sources to finance nearly 126,000 home loans. HFAs have financed more than 3.2 million home purchase loans over time. 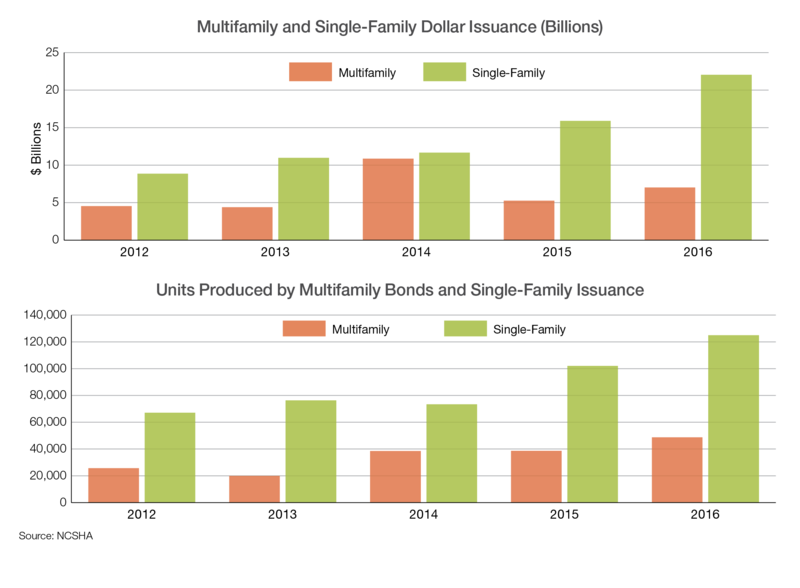 HFAs also issued more than $7 billion in multifamily housing bonds in 2016, to support nearly 49,000 affordable apartments. HFAs’ multifamily portfolios, as of the end of 2016, consisted of more than 16,000 properties containing more than 1.2 million apartments. State HFAs provide housing financing to all parts of their states — urban areas, rural communities, suburban towns, and tribal lands — and to borrowers who otherwise would not be served. Seventy-two percent of all HFA home loans in 2016 went to borrowers earning their area median income (AMI) or less. The median borrower income for HFA loans in 2016 was just under $50,000 — 14 percent lower than the national median family income. On the rental side, state HFAs administer the federal Low Income Housing Tax Credit (Housing Credit) program. The median income of a Housing Credit apartment resident was $17,470, compared to $35,000 for all renters in 2015. More than 80 percent of all households in Housing Credit apartments earn 50 percent or less of AMI. In 2016, 31 HFAs used the Housing Credit to serve people with disabilities, 28 targeted rural populations, and 25 served households experiencing homelessness. A 2018 study of more than one million low- and moderate-income mortgages found that single-family loans originated through state HFA programs perform better than similar non-HFA loans to low- and moderate-income borrowers. Overall, HFA loans were 20 percent less likely to experience a long-term default. They were also 20–30 percent less likely to be foreclosed. Over time, HFAs’ capacity and performance have earned the agencies the primary responsibility for delivering an array of federal housing programs in their respective states. 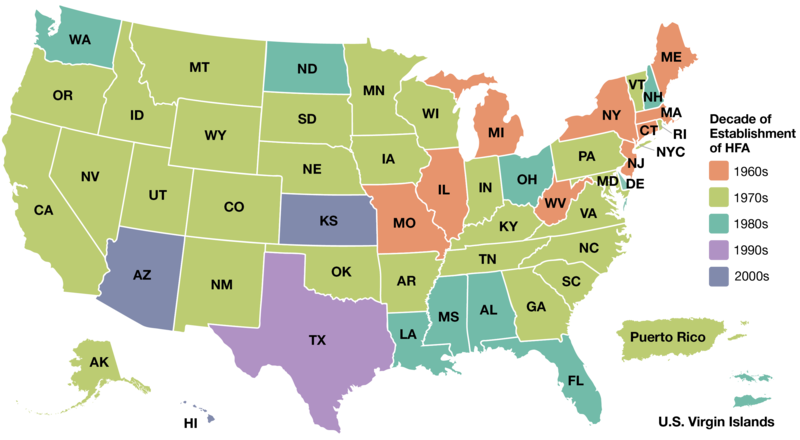 39 state HFAs administer the federal Housing Trust Fund in their states. In addition to their expertise in leveraging private investment in housing, HFAs have an established track record in administering public programs, which has often generated substantial savings for taxpayers. One example is HFA administration of “project-based” rental assistance vouchers. HFAs have cut waste in the underlying Hud Section 8 housing assistance program, ensured that properties remain in strong physical and financial condition, reduced the number and amount of improper subsidy requests, and promoted increased compliance with HUD policies and procedures. HFA bond programs attract new capital investment into their states. They also enable the agencies to use their balance sheets in innovative ways to generate new funding for housing investments that otherwise would not be made. And HFAs often reinvest their earnings in new products and services to meet their states’ housing needs. HFA financing and programs are also major drivers of economic activity in their states — generating jobs, wages, and local revenue. one example is the agencies’ financing of new construction of affordable homes through their bond programs and development of rental apartments through the Housing Credit. These activities in 2016 generated more than 100,000 jobs, nearly $10 billion in wages, and $1.6 billion in local revenues on a one-time and annually recurring basis combined. 1 “The 2014 Strategic Plan for the Conservatorships of Fannie Mae and Freddie Mac,” May 13, 2014, FHFA. 2 “Low Income Homeownership and the Role of State Subsidies: A Comparative Analysis of Mortgage Outcomes,” Moulton, Record, and Hembre, 2018, Fannie Mae. State HFAs are resilient providers of capital for affordable homeownership and rental housing for their states. They are reliable partners to the other key players in the American affordable housing system. And they are ready participants in the business discussions, policy-making efforts, and advocacy campaigns that will shape the housing market of the future. Want to learn more? 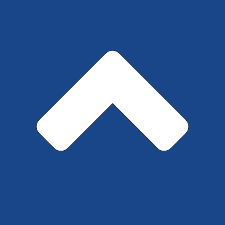 Sign up for updates.